WASHINGTON — With just days left to enroll, fewer people are signing up for the Affordable Care Act , even though premiums are stable, more plans are available and millions of uninsured people can still get financial help. Barring an enrollment surge, the nation's uninsured rate could edge up again after a yearslong coverage expansion that has seen about 20 million people obtain health insurance. A status report Wednesday from the Centers for Medicare and Medicaid Services showed nearly 20 percent fewer new people signed up than at about the same time last year. New sign-ups drive the growth of the HealthCare.gov marketplaces, helping keep premiums in check. The sign-up deadline in most states is this Saturday, for coverage beginning Jan. 1. A few states that run their own health care websites have later deadlines. Trying to encourage enrollment, former President Barack Obama posted a whimsical video on social media Monday encouraging young adults to sign up for his signature program. That same day, a crush of people tried to enroll in what was the highest traffic this open enrollment season. Disappointing sign-ups will add to the long-running political blame game over health care. Democrats accuse the Trump administration of "sabotage" on the health law. Republicans counter that pricey Obama-law premiums are too high for solid middle-class people who don't qualify for taxpayer-financed subsidies. The Trump administration said in a statement this week "our primary goal is to provide a seamless open enrollment experience for HealthCare.gov consumers and ensure that those who want coverage offered through the (program) can enroll in a plan." Health and Human Services Secretary Alex Azar also posted his own straightforward video pitch on Twitter. The new numbers suggest there may be less demand for government-subsidized insurance during a time of strong economic growth. But interviews with current and former officials, consumer organizations and independent experts also revealed several factors that appear to be cutting into enrollment. —Lack of a strategy for expanding HealthCare.gov, the federal insurance marketplace. The Trump administration didn't set sign-up targets for the health overhaul, according to a report this summer from the nonpartisan Government Accountability Office. Such targets are a standard management tool for government agencies. "Marketing does matter," said Peter Lee, executive director of Covered California, a state-run insurance marketplace. "Not doing active promotion millions of Americans are not going to find their way to HealthCare.gov." The administration has been using targeted emails and social media messaging , but that's nowhere near the effort expended in the Obama years. 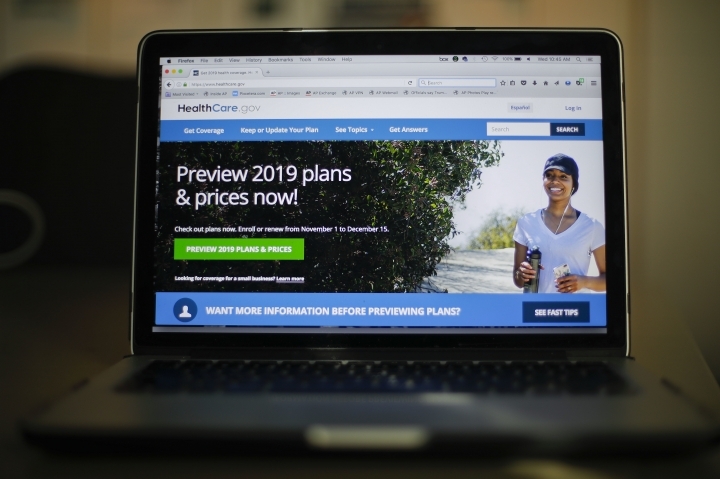 Administration officials say they are focused on providing a smooth sign-up experience for consumers who want coverage. —No penalty for being uninsured. The GOP-led Congress repealed the fine for being uninsured, effective this Jan. 1. The tax penalty was the most unpopular part of Obama's law. "The really big change taking effect for this open enrollment period is repeal of the individual mandate penalty, so that is very likely a major factor," said Larry Levitt of the nonpartisan Kaiser Family Foundation. The administration also increased access to lower-cost plans that provide less coverage than the more comprehensive insurance offered under the overhaul. Short-term health insurance plans don't have to offer basic benefits such as prescription drugs, and insurers can turn down people with medical conditions. But such plans may appeal to healthy people looking for a measure of financial protection against an unexpected illness. Organizations working to enroll low-income workers report heightened concerns among immigrants that applying for health insurance could have negative consequences due to the administration's crackdown on illegal immigration. Only legal immigrants and citizens can get coverage through HealthCare.gov, but that hasn't calmed the fears. "We've had a lot of green card holders coming in because they think they might be affected," said Kori Hattemer of Foundation Communities, a nonprofit organization in Austin, Texas, that helps enroll people for coverage. "Pretty much every day we have someone asking us about it." Hattemer says their enrollment numbers are about 9 percent below the same time last year. Last year about 11.8 million people signed up for subsidized private health insurance during the ACA's open enrollment period. Some 10 million are still enrolled. Current customers who don't want to make any changes will get coverage automatically renewed for 2019. Separately, another 12 million low-income people are covered through the health law's Medicaid expansion. A former Republican Senate health care staffer who launched Rhode Island's health marketplace said ongoing consumer education is needed to grow enrollment. Christine Ferguson said many healthy people don't realize the value of coverage until something bad happens to them. But boosting sign-ups "was not a priority" for the Trump administration, said Ferguson, now a consultant. President Donald Trump failed to outright repeal the ACA last year. The AP's VoteCast survey during this year's elections showed that 59 percent of voters want the government to ensure coverage for all Americans. But voters had mixed views of the ACA, with about half saying it should be repealed totally or in part. About a third said it should be expanded.